After the past two story arcs, readers may be suffering from event fatigue, so DC has dusted off an inventory story. It’s a brief interlude between bigger events, in which Batman journeys into Gotham’s sewers in search of a boy kidnapped by the followers of Deacon Blackfire. Batman himself muses as to whether Blackfire is a ghost, demon or metahuman. He first appeared in the 1988 miniseries, The Cult, by Jim Starlin and Bernie Wrightson. I found that series to be a huge disappointment, so I am not altogether pleased to see Deacon Blackfire resurrected here. The truth of his being is still unresolved, but he appears to be some form of demon who feeds off doubt and fear. 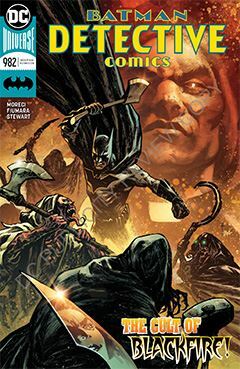 Like in The Cult, Batman comes dangerously close to being beaten, hallucinating his worst fears and failures, until one of the deacon’s followers switches sides. The story by Michael Moreci is mostly battle, the tide turning both for and against Batman at various points. Very little is resolved, and there just isn’t much meat on these bones. But it fills 22 pages, and serves as a palette cleanser for those weary of major conflict among the various members of Batman’s personal Justice League. However, the artwork by Sebastian Fiumara and Dave Stewart elevates the story. Together, they create texture and mood within the sewer tunnels and various underground chambers. Water, fabric, stonework and filth are rendered not just effectively, but beautifully by these two artists. I think they’re a team worth keeping, should DC have more stories that would suit their combined talents.